We all know that you should never leave a dog unattended in a hot car, but what do you do if you discover a dog in trouble? As a driving instructor it’s my job to help people stay safe out on the roads. I want to include some information here, on my blog, so everyone can benefit, not just those out on a lesson. With the British summer finally kicking in, I thought I would share this information about how we can help our four legged friends in this beautiful weather. Help a dog in a hot car! Don’t be afraid to dial 999, the police are available to help with animal welfare assistance and will be able to contact the RSPCA directly. Establish the animal’s health/condition. Is the animal responsive? Panting excessively? 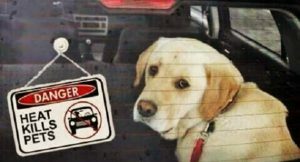 If the situation becomes critical for the dog and the police are too far away or unable to attend, many people’s first instinct would be to break into the car and free the dog. If you decide to do this, please be aware that without proper justification, this could be classed as criminal damage and, potentially, you may need to defend your actions in court. Make sure you tell the police what you intend to do, why, and take images/footage of the dog and the names and numbers of witnesses to the incident. The law states that you have a lawful excuse to commit damage if you believe that the owner of the property that you damage, would consent to the damage, if they knew the circumstances (section 5(2)(a) Criminal Damage Act 1971). If you’re at a superstore/venue/event, ask the staff to make an announcement to alert the owner of the situation. You can also call the RSPCA cruelty line for advice any time on 0300 1234 999. However, if the dog is in danger, dialing 999 should always be the first step. Please also remember to take plenty of water with you if your taking your dog out. Even for short periods of time a car can get very warm! Thank you to the RSPCA for this great information, Lets make sure we all stay safe this summer, Including our four legged friends.